Deep-dish pizza is one of the great defining culinary traditions of Chicago (another being the great Italian beef sandwich, a specialty I recently made, far away from “Chi-town” on my little island – post to follow…). The crust is like a tycoon – rich and powerful. It has a chewy, buttery bread-like character of substance. It can require a knife-and-fork for eating, unlike than thin-crust pizzas, which are easy enough to eat with one’ hands. One or two slices generally will be a full meal, for most people. The toppings can range from plain cheese-and-tomato to the excessive – by Italian standards – of pizzas with “everything” or “all-dressed”, as we say here in Canada. I grew up eating the deep-dish of Pizzeria Uno and Due (and not the chain with the same name as the former – I have tried it and found it very different, that is, disappointing and not up to the standard of the original). During my vegetarian youth, I liked the spinach, mushroom, and garlic version. While I had good stuffed pizza in May in Chicago, I had another “yen” – as my late grandmother Jessie would have said – for deep-dish pizza. I had tried one recipe from AllRecipes last year supposedly for Pizzeria Uno’s version. It was good but not quite up to the Sewell pizza. Thus, I turned to the stalwart Cook’s Illustrated, or America’s Test Kitchen, for their interpretation. I really did not adapt much of the recipe, other than adding chili flakes to the sauce (I am sure this is the Pizzeria Uno approach, too) and brushing the crust with olive oil. 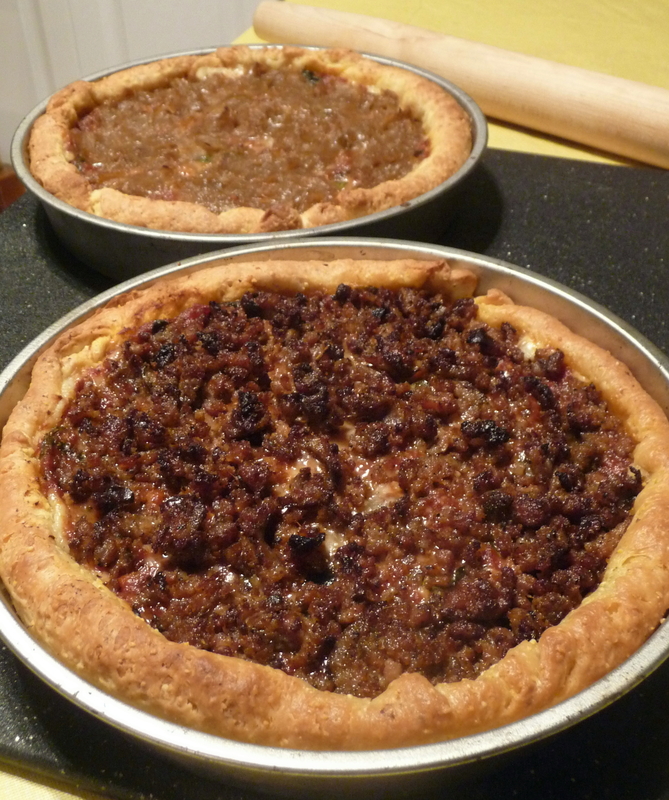 My choice of toppings was not strictly Chicago traditional, chorizo on one and caramelized onions on the other. This recipe makes two pizzas, which is good for variety and experimentation. The crust is very similar to Pizzeria Uno’s, with a buttery flavour, thick and chewy. It is substantial and satisfying with a decided crunch, thanks to the cornmeal– quite different from the original Neapolitan, of course. The Cook’s Illustrated recipe for the sauce is true to the Chicago original, though I felt it needed more heat and used the classic chili flakes – often served in shakers in Chicago pizzerias of various stripes as another seasoning besides salt, pepper, and parmesan cheese. The only warning about the recipe is that the crust is more time-consuming and a bit finicky, compared to making a thin crust. However, it is worth following the explicit, if rather complicated, directions to produce a wonderful taste of Chicago – wherever you may be. 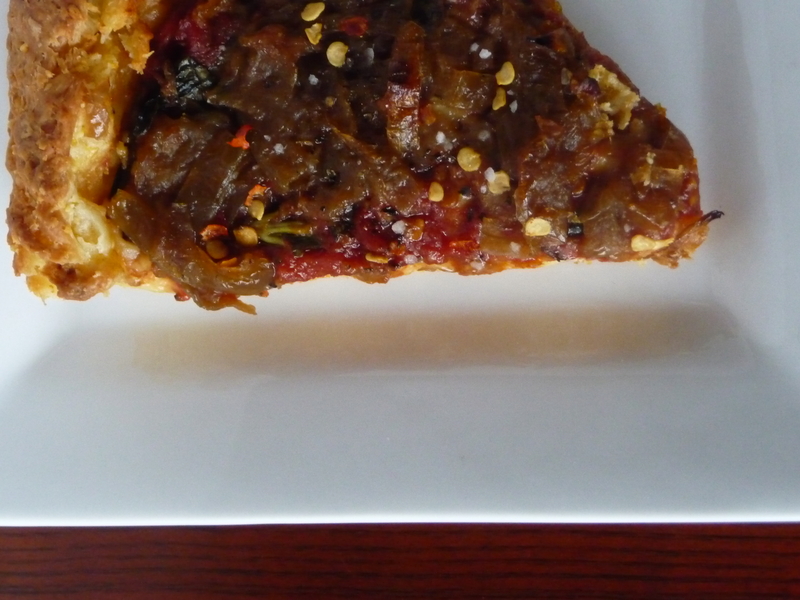 It is a worthy pizza to enjoy in the midst of Xmas celebrations or any other time you would need a deep-dish experience. Makes two 9-inch pizzas, serving 4 to 6. Published January 1, 2010. From Cook’s Illustrated (with my adaptations, following). FOR THE SAUCE: While dough rises, heat butter in a medium saucepan over medium heat until melted. Add onion, oregano, and 1/2 teaspoon salt; cook, stirring occasionally, until liquid has evaporated and onion is golden brown, about 5 minutes. Add garlic and cook until fragrant, about 30 seconds. Stir in tomatoes and sugar, increase heat to high, and bring to simmer. Lower heat to medium-low and simmer until reduced to 2 1/2 cups, 25 to 30 minutes. Off heat, stir in basil and oil, then season with salt and pepper. TO LAMINATE THE DOUGH: Adjust oven rack to lower position and heat oven to 425 degrees. Using rubber spatula, turn dough out onto dry work surface and roll into 15- by 12-inch rectangle. Using offset spatula, spread softened butter over surface of dough, leaving 1/2-inch border along edges. Starting at short end, roll dough into tight cylinder. With seam side down, flatten cylinder into 18- by 4-inch rectangle. Cut rectangle in half crosswise. Working with 1 half, fold into thirds like business letter; pinch seams together to form ball. Repeat with remaining half. Return balls to oiled bowl, cover tightly with plastic wrap, and let rise in refrigerator until nearly doubled in volume, 40 to 50 minutes. Coat two 9-inch round cake pans with 2 tablespoons olive oil each. Transfer 1 dough ball to dry work surface and roll out into 13-inch disk about 1/4 inch thick. Transfer dough to pan by rolling dough loosely around the rolling pin and unrolling into pan. Lightly press dough into pan, working into corners and 1 inch up sides. If dough resists stretching, let it relax 5 minutes before trying again. Repeat with remaining dough ball. I added 1 tsp chili flakes to the sauce (and more for serving, optional). To make the edge of the crust, I brushed it with more olive oil. I added fresh hot chorizo sausage (which I had sautéed and crumbled once cooked through) to one pizza on top of everything before putting in the oven. 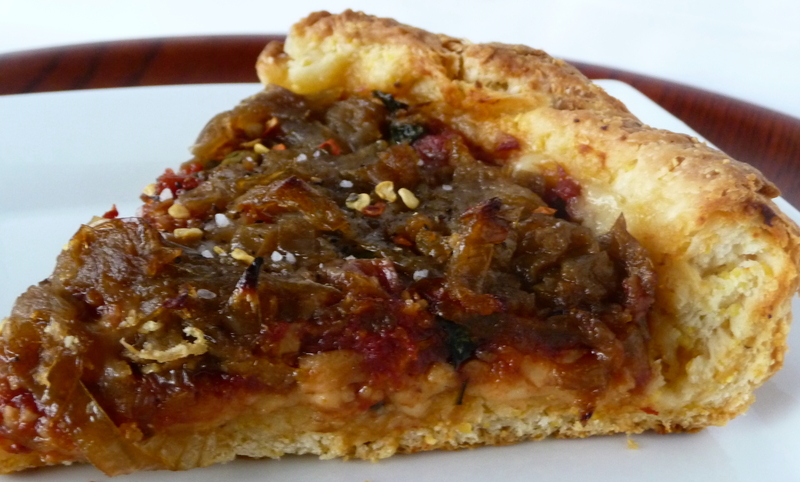 The other pizza had caramelized onions (which I frozen, having made a huge batch months before in a slow-cooker – recipe I should post some day). 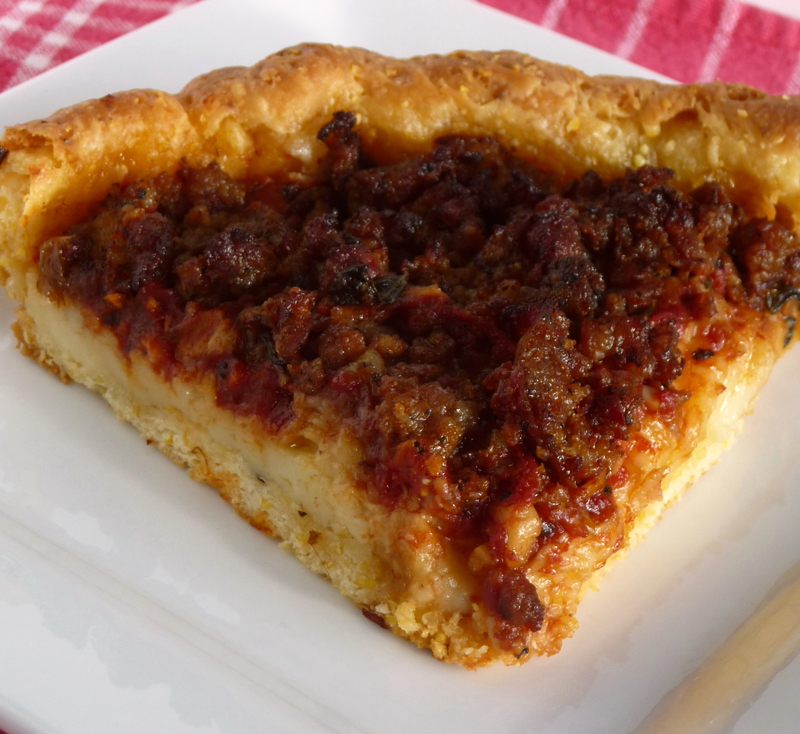 This entry was posted in Brunch, Holidays, Main courses, Pizza, Recipes Misc, Vegetarian and tagged Brunch, caramelized onions, Chicago, deep-dish, Dinner, food history, lunch, Pizza, vegetarian. Bookmark the permalink. Thanks, Rachel. I bet you can knead the dough by hand, for perhaps seven to eight minutes? I’m not sure how long it would take, but it is worth doing. The dough is very easy to make (granted, I used the stand mixer) and work with, that is, rolling out and fitting into the standard cake pans. You have a good idea for a new year’s tradition – I might borrow your idea…. It worked beautifully–even kneading by hand! I’ll have a post tomorrow on it, but the pizza was delicious! An important note on Chicago thin crust pizza from another Chicago native: It should be cut into squares (with odd-shaped edge pieces), not into slices a la NY pizza. Hi, David. It was good to hear your native-Chicago-boy comments. I hope all is well with you in the City of Big Shoulders. You’re absolutely correct about the squares. No triangle-shaped pieces or references to “pizza pie” in Chicagoland, either…. Merci, Pierre. Bonnes fêtes à toi à Paris. I have been educated. I also seem to remember you promising to feed me some of this famed Chicago-style pizza when I’m in town, so I’m looking forward to a physical education as well! I must admit, it does look quite delicious… perhaps you can convert me fully from my pizza-hating ways! PS: I like the new recipe layout! Very clear and concise! Thanks, Jax. I know you will embrace the Chicagoland pizza after you first encounter it. It may be the deciding factor if your deeper feelings about pizza. Maybe I’ll continue to use the ATK/CI recipe layout – it’s theirs, not mine, but thanks for your feedback. Hi Dan! The deep dish has always been my favorite type, although less popular now due to carbphobia. The chorizo one sounds magnificent, and I am willing to put in the time for that decadent looking crust. Happy almost New Year. Have a great one! —P.S. There has been a lot of funny comments going around my extended fam. asking me who this famous blog fan “Dan” is. 🙂 You were my first commentor I believe. Hi, Geni. I am waiting for “carbphobia” to go the way of “Just Say ‘No’ to Drugs” (remember Nancy Reagan’s campaign?) – both ineffective. The crust is worth a few more minutes of prep. I didn’t mind doing it for such an outstanding result. Try it – you’ll like it (you get that reference, I bet). I’ve had a few Chicago deep dish pizzas. Whether it was authentic or not, I have no idea. I’m generally partial to the more traditional pizza. I usually stay away from foods that make me feel like I can’t stand up and breathe after consuming them. Unfortunately, deep dish pizzas are one of those. I prefer smaller servings so I can try everything. I was born in the 70’s (’75, to be exact) so I only know the decade through movies, parents’ old photos, etc. If the food trend of the 70’s were high fat, high calorie, then how were people able to fit into those tight, clingy polyester clothes???? Most people (in the US anyway), won’t be able to pull off 70’s fashion today. You have to be quite svelte to wear 70’s clothes. My parents have loads of 70’s era photos of themselves. I can’t help but cringe at some of the stuff they wore! Thanks, KM. I am glad you discovered the paradox of the wretched excess and contradictions of the 1970s. There was also a booming market for low- and no-calorie foods (remember Tab? ), diet fads became huge, and eating disorders developed more in that era, I suspect. Of course, the clingy clothes were marketed primarily for the young, obsessive dieters, disco-goers, and those with fast metabolisms, i.e., the thin part of the population. Yet those other who were not emaciated also would wear such unflattering and unforgiving clothing. It was an odd era…. I have not had Chicago style of stuffed pizza in so long. Its been thin crust NY style for a while now. You have me craving to get back to my Midwestern roots. Hi, Louann. You can’t escape your Midwestern roots – nor cravings for deep-dish pizza, for that matter…. I was in Chicago in the early 1970’s and ate at a little place called Chicago Pizza. The pizza was served upside (crust on top, toppings underneath) down in an 8×8 square pan, and sooooo good!!! To serve it had to be filpped over with a spatula onto a plate. Definitely not a finger food. I remember it being a basement-type restaurant in a block of what looked like row houses, not far off Lake Shore Dr. Does this ring a bell with you? I’m going back to Chicago in a couple of weeks and would love to go back if it’s still there, but can’t find it thru the usual methods. Thanks! They are at 2121 N. Clark Street. They have the stuffed pizza you describe, but I have never encountered the square pan, nor the flipping. Good luck and let me know if you try one – or both! That looks heavenly. I’ve never tried chicago style before, but I’m definitely more interested now!